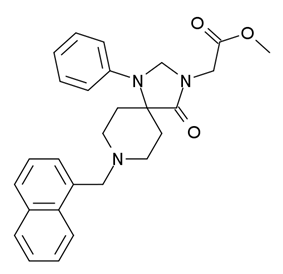 NNC 63-0532 is an nociceptoid drug used in scientific research. It acts as a potent and selective agonist for the nociceptin receptor, also known as the ORL-1 (opiate receptor like-1) receptor. The function of this receptor is still poorly understood, but it is thought to have roles in many disorders such as pain, drug addiction, development of tolerance to opioid drugs, and psychological disorders such as anxiety and depression. Research into the function of this receptor is an important focus of current pharmaceutical development and selective agents such as NNC 63-0532 are essential for this work.